(100) $100 Visa gift card. (400) $50 Visa gift card. (650) $25 Fanatics gift code. (146) A pizza coupon prize pack for Red Baron, Freschetta, or Tony's pizzas. (1) A kitchen makeover, awarded as a $15,000 check. (50) A $25.00 gift card. Everyone loves Twix! And they have some great prizes they are giving away! You can enter every day. So go ahead - here it is! (5) Game Prizes per person during the Game Period. Great Father's Day Sweepstakes to enter! Two Great Summer Summer Sweepstakes to Enter Daily! (1) Grand Prize Winner will receive 4 tickets to Prize Police on E! (1) Grand Prize: A Check for $50,000 (to go towards backyard makeover), Skype consultation with licensed contractor from HGTV. Two Great Summer Sweepstakes/Giveaways to enter daily! Wal-mart and Driscoll's! (1) GRAND PRIZE winner will win a trip for winner him/her and three (3) guests to New York, NY. Limit: One (1) Instant Win Game prize per person. Kraft Sweepstakes/Giveaway with lots of prizes! Enter daily! Another Instant Win Giveaway, with lots of Prizes! Enter daily, increase your chances of winning! (1) Grand Prize Winner will receive a 6 day/5 night trip for two to the Travaasa Hana all-inclusive resort in Maui, Hawaii. Great 2014 Memorial Day Sweepstakes that will make 16 (Winners) super happy! I know I would be happy to win any of these prizes. Gotta love Overton's. Remember to Bookmark us, Like our Facebook Page (listed on Sidebar) or Follow us on Twitter @Free_Or_Win to keep up to date on our posts. Also, check out "Our Giveaways" (Sidebar) while you are here. Want to enter this month's Giveaway? It's easy! 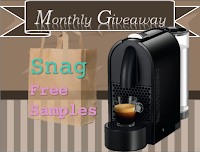 All you do have to is Enter your email address to join Snag Free Sample's 100% FREE samples newsletter and enter the drawing for a Nespresso U D50 Espresso Maker with Aeroccino Milk Frother! This contest ends 5/31/2014 at 11:59PM Eastern time, and the winner will be drawn the following day. Check out their awesome Twitter and Facebook pages as well! Remember to bookmark our Blog or Like our Facebook Page for updates. Two more great Giveaways! Hallmark Channel Mothers Day Sweepstakes (Win some great prizes for mom!) and Victoria's Secret Giveaway! Lots of Prizes to be won from this Giveaway! Got to love Post Cereal! Trip for one (1) winner and up to three (3) guests to attend WWE's WrestleMania 31 event on March 29th, 2015, and a private meet and greet opportunity with WWE Superstar John Cena (subject to availability). * Start off with 1 entry, then can earn entries. Maximum 31 entries for entry period. Another Hallmark Channel Giveaway that you still have a few days left to enter. Good Luck! Remember to bookmark us or Like our Facebook Page for updates. Also be sure to check out "Our Giveaways" on the sidebar. What amazing Gifts you can win for your Mother for Mother's Day! Overstock is really going overboard! I'm loving it, though! 15 Prizes in all and you can enter Daily. Don't you just LOVE those sweepstakes that give away lots and lots of prizes? I do! It makes you feel like you have a better chance at winning something out of it! Well Aquafina has two things going on at once. A Contest and a Sweepstakes. The Contest you can only enter one time, the sweepstakes you can enter daily. But take a look at the Prizes! Great Giveaway! Two more awesome Giveaways! Food Network and CBS. Please always be sure to follow the rules when entering Contests. Enter to win a trip for 2 to New York, NY. Good Luck! Remember to Bookmark us or Like our Facebook Page to keep updated on new posts! Two great channels that we all love to watch - having wonderful Giveaways! (1) Grand Prize winner will receive a 3 night trip for 8 to Orlando, Florida! Grand Prize winner will win a trip for 2 to the 50th ACM Awards in Dallas, TX. Click Here for gorgeous birthday roses delivered!